Sometimes I just want to change up dinner and try something new. I don’t know if I’m late to the party, but these potatoes are the bomb. They might be so 2014 because I think I saw these all over the Web last year. Recently, I was at the farmers market thinking that I just keep walking by Weiser Family Farms‘ lovely little potatoes week after week. I hadn’t bought them in a while because I didn’t feel inspired. Then it just hit me: I must buy these potatoes and smash them. And so I did. Revelatory. 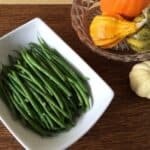 This is such a simple yet satisfying recipe. What took me so long? Don’t wait like I did. After loving these smashed potatoes during weekday dinners, I decided to add them to the Passover seder dinner table. 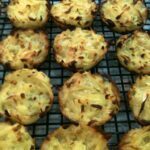 I knew my family would love them, but I hoped they wouldn’t complain that our beloved Potato Latke Muffins were missing from the table. 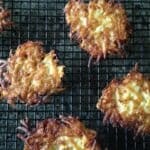 After all, potato latke muffins have been a Passover family favorite for decades. So here it was moments before Passover dinner was served at my house, and everyone was hanging out in the kitchen hovering. Why does everyone end up packed into the kitchen during a party? 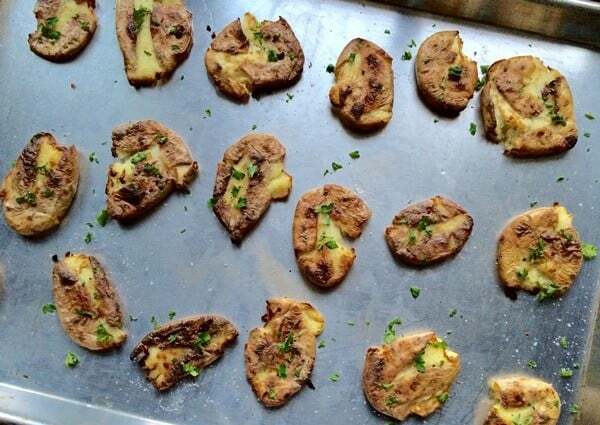 My brother-in-law spotted the smashed potatoes parked on the stovetop waiting to go into the broiler. “Wow, what are those?”, he exclaimed. “They look amazing!” Everyone rushed the stove to see what he was talking about. Then a cacophony of commentary came from the others: “Oh, those are so cute.” “I just want to grab one.” “How’d you make those?” “Did dad run those over with his car?” My family went nuts for these cute, delicious potatoes, and that was before they even tasted them. Once served, the potatoes were a big hit. Some people even had three helpings. So remember, you can never make too many of these potatoes. 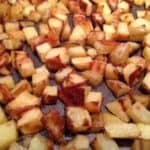 These crispy potatoes are easy to make and versatile enough to be served for a week night meal or a holiday dinner. Don't say I didn't warn you that they are addicting. 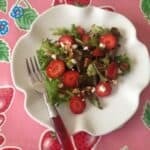 Recipe can be increased depending how many people being served. Preheat oven to 375 degrees F. Put one oven rack on the second level from the top and another rack just below the middle. Wash and dry small potatoes, and poke them once with a fork so they don't explode in the oven. 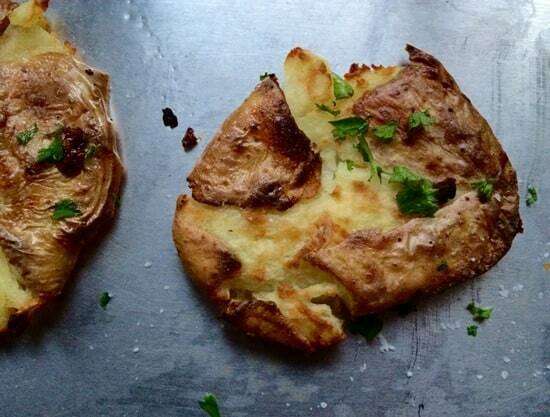 Place potatoes on a rimmed baking sheet ( Do not use parchment-- it burns). Bake on the lower rack for 30-45 minutes or until soft. About halfway through cooking, give the pan a few brisk shakes so that the potatoes rotate around.The total time depends on the size of your potatoes and the particulars of your oven. Place potatoes on the higher rack under the broiler for about 4-1/2 to 6 minutes or until the tops are crispy and dark golden brown. Watch carefully because, you know, food burns quickly under the broiler. Remove from the oven. Sprinkle with remaining salt to taste and chopped parsley. Serve immediately. Let me know in the comments if you try these. I want to hear if your family goes nuts too. These look so good and I’m sure everyone loves them! Thanks Jacqueline. They’re also great as an appetizer with vegan toppings– they make a good base similar to a cracker. They remind me of something pretty I’ve seen on your blog with stacked up dip/cashew cheese and colorful veggie garnishes. Hi Greg- nice to hear from you this weekend as I was thinking about you while at Camp Blogaway. Thanks so much. It doesn’t get any better than easy and tasty. I made these awhile ago and completely forgot about them. Thanks for jogging my memories as they wonderful. I sprinkle them with sea salt and malt vinegar. I love the idea of the vinegar. Potatoes are a great canvas for so many flavors. I love these! And I know what you mean about folks hanging out in the kitchen!! Yes, in my house in seems like there’s a lot of hovering over the food, like they can’t wait to pounce. I’ve only made smashed potatoes a few times–hard to get the right size–but each time they have been a huge hit with my family. I could see everyone standing around in the kitchen asking about them! Over the Christmas holidays we hosted my family of origin, and everyone ended up in the kitchen. Great fun. You’re so right about making a ton! Hi Kirsten, sounds like we’ve had a similar experience! I am fortunate that I can get the small sized potatoes every week at my farmers market from Weiser Farms. I have also seen small potatoes from Melissa’s Produce at the supermarket.